The team at TopRank Online Marketing would like to wish our online community a very merry holiday season. I for one get very nostalgic around the holidays and count down the days (starting in October) until I get to gather with family and friends to share a meal and make new memories. For many families, part of the holiday tradition includes singing carols and watching Christmas movies from their childhood. There is one song in particular that gets stuck in my head every holiday season is The Twelve Days of Christmas. 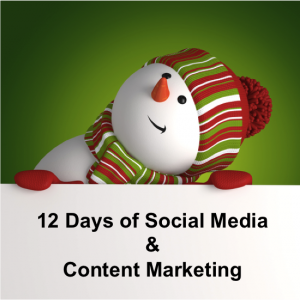 For a fun spin on a classic we bring you some of our favorite tips for the 12 Days of Social Media, Content Marketing & SEO. Setting up a social media profile and expecting to immediately generate results is an unrealistic approach to social media marketing. Identifying and reaching out to prospects, influencers, and current customers on a regular basis will begin setting the groundwork for an engaging social strategy. In addition to providing relevant and engaging content for your online community you should also offer guidance and help where appropriate. Say for example that you are spending time on a LinkedIn group and find that someone within the group poses a question related to your area of expertise. This presents the perfect opportunity to offer something of value without asking for something in return. How many golden eggs are you getting from your social strategy and how many are duds? Many of the tools that you are using to implement your social strategy can also provide insight and reporting of how your social profiles are performing. Platforms such as Facebook and LinkedIn have built in insights that do not cost any additional money. A hub and spoke content marketing model is similar to a choreographed dance. Once you determine which of your web properties will be your centerpiece (or hub) you can begin creating and promoting content for your other sites (or spokes) that will drive traffic to your hub. Your online network can provide a great deal of inspiration for your content plan. A simple yet engaging question to your Twitter or Facebook followers can provide a wealth of content that can be used for blog posts, website content, additional social posts, etc. Which social media or content marketing tip do you think is the most essential part of a successful online marketing strategy? Whatever your plans for the next couple weeks we would like to wish you a happy, healthy, and safe holiday season. Thanks for sharing your experience. I do get personally frustrated when I hear “Social doesn’t work” or see it pitted up against SEO or other tactics using metrics that only apply to direct sales or last-touch attribution. As you said, it needs to be used *with* other effective tools, as one of the spokes in your wheel, not a standalone, arms-length effort. Content promotion plays a large role and contributes to the level of viewership that a site’s content will get. Content are represent the whole information about your website. But, It’s important that in which way you represent the content and how much data you gathered in multi content. Great post… Content marketing it looks so easy, but fact is that it’s a toughest. As Sanket Patel told way of presentation is one of the most important part of the marketing. May I know how to deal with service industry like my site is design & development related, So what steps should I have to be careful while attempting social media? content is a great part of any blog or website as content will be the king in the end so it must be unique & healthy. bit without content in internet marketing. be related in order to achieve well in search engines. True, and importantly, to appeal to and convert customers! The best part here is: Detailed plan for 12 days, one-by-one. And placing out the marketing and writing patterns. Rich content is surely the king, and teaming it up with a nice social media marketing plan is a must go for today’s bloggers. nice very nice article it is very useful. Thanks for sharing your experience us…! The content of every site is very important to attract customers. Make sure you have the most appealing and significant data to present. This will lead you to achieve good placement in every search engines.